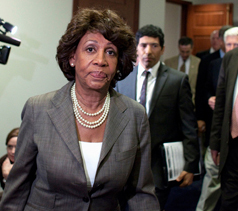 WASHINGTON (AP) — The House Ethics Committee concluded Wednesday that Rep. Maxine Waters’ rights weren’t violated in an ongoing investigation, clearing the way for the panel to determine whether the California Democrat improperly tried to steer federal money to a bank where her husband is a shareholder. Her allegations of unfair treatment led to the extraordinary decision in February by the committee’s five Republicans and its top Democrat to step away from the case. Six new members were added to handle the investigation and an outside lawyer, Billy Martin, was hired to investigate the committee’s conduct. The committee, which has five members from each party, investigates whether lawmakers violated House rules and can recommend punishment such as a reprimand, censure or even expulsion. Waters, a senior member of the House Financial Services Com­mittee, has denied wrongdoing. Waters had no immediate comment. A letter to Waters by the acting chairman, Rep. Robert Goodlatte, R-Va., and the acting top Democrat, Rep. John Yarmuth of Kentucky, said Martin concluded that Waters’ rights were protected and there was no wrongdoing by lawmakers. But the letter cited unauthorized leaks of investigative information by committee staff and by Waters. Waters has contended that committee procedures did not give her a chance to present her case and unduly delayed the investigation, which began in late 2009. The most explosive allegations, which led to the committee shake-up, centered on the leak of internal committee documents to the news media and communications among some staff investigators and Republican committee members. The letter said a review has not uncovered the identity of the other leakers but assumes a staff member who invoked Fifth Amendment rights against self-incrimination could have been responsible. The committee concluded the disclosures occurred after formal charges were brought against Waters and therefore could not have had any effect. Responding to Waters’ allegations of improper contacts among staff members and Republican lawmakers, the letter said these communications could not have influenced the case. “Staff does not and cannot become independent operators.” the letter said. Waters has contended from the start that she did not try to steer federal bailout money to OneUnited Bank, where her husband had stock and at one time served on the board. She said she did try to help an association of minority-owned banks, which included in OneUnited. They were in trouble partly because of their investments in troubled mortgage giants Fannie Mae and Freddie Mac. In August 2010, the committee charged the 11-term congresswoman with three counts of alleged ethics violations. Waters asked for a proceeding that would amount to an ethics trial, but it never took place after the internal committee turmoil erupted over the Republican communications with staff. OneUnited eventually received $12 million in bailout money, but federal officials have said Waters was not involved in the decision.